This is only available through the end of May. Download a free copy of the audio book of The Hole in Our Gospel: What Does God Expect of Us? 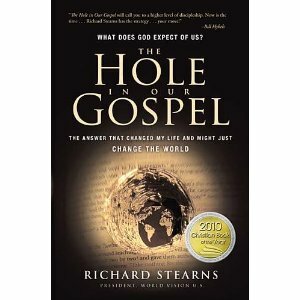 The Answer That Changed My Life and Might Just Change the World by Richard Stearns, about it president of World Vision U.S. This book is well worth your time. I have listened to it over the past few weeks and cannot adequately describe how much impact this book has had on me personally. May the Lord continue to break my heart and yours by the things that break God’s heart. The Hole in Our Gospel is the story of “how a corporate CEO faced his own struggle to obey God whatever the cost, buy information pills and his passionate call for Christians to change the world by actively living out their faith”. The book starts by alternating between the personal journey of Stearns and the story of World Vision. There will be places within the story that break your heart – or at least they did mine – places where you can identify, medic places where you believe there is no way that we could overcome such tragedy and then a renewed hope for your purpose and this world. Click here to download the audiobook. Use the coupon code MAY2010 when checking out to receive the audio book for free. It comes in 27 parts that you have to download individually, but they are quick to download with high speed. It is only available in May, so download it now! If possible, I suggest listening to it with a friend, your spouse, your children or your small group. There are many great conversations that will come. Please let us know what you think of the book after you have a chance to listen/read it. Your continued support for Authentic Christian Living and our personal growth is a blessing that we are thankful for every day. Our ministry continues to grow through the Lord’s blessing and your efforts to share Authentic Christian Living with your friends and family. “Like” us on Facebook. Simply click “like” at the top of the Facebook page. Please also let us know that you like any posts by clicking “like” under any new posts that you like. Invite your friends on Facebook. Click “suggest to friends” on the left of the Facebook Page and click your friends that you would like to suggest the page to. Facebook bug: We have noticed that this Facebook feature only works properly when you choose 15 or less friends at a time. Subscribe to the newsletter. This is a daily email of any new materials posted on the website and makes it easy for you to forward to your friends that may not be on Facebook. Stubleupon or other online bookmarking sites? Please use the “share/save” button at the bottom of any post to easily bookmark the post on any of these sites that you use. This is extremely helpful in letting new people find us. Email articles/videos to your friends. The “share/save” buttons at the bottom of each article also let you email the article to your friends using Gmail, Yahoo or others. Share on Facebook. There are links under most new entries on the Facebook page to let you easily share the post with your friends. Have a blessed day and thank you for your continued support.